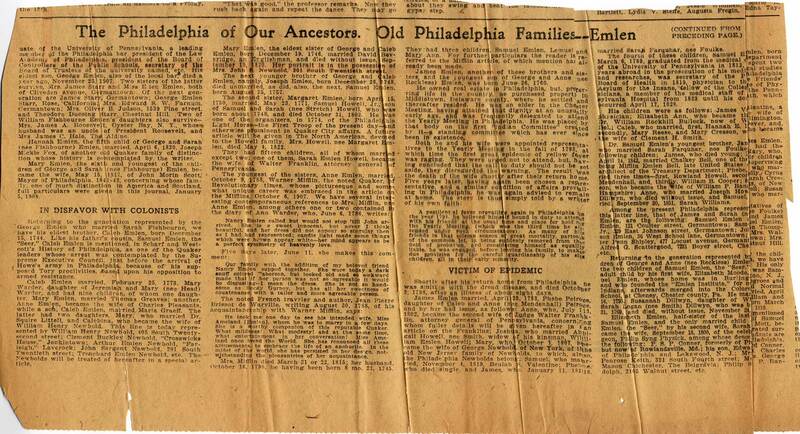 Among the old Quaker families which, at the earliest period of its history gave to Philadelphia its distinctive title of the "Quaker City," was that of the Emlens; a name which, for over two centuries, has been a synonym for probity, integrity and approved citizenship–always exemplifying its family motto: "Honestum praetulit utili." It is a tradition in the family that the Emlens came originally from Wales, though the emigrant ancestor was of English birth. These facts are cited in proof of the conjecture: Emlyn Cantred was one of the divisions of southern Wales, "in the tymes of the Brittaines." Here stood Castle (afterward New Castle) Emlyn on the river Teivi. We are told that "the name (which was common among the Britains anciently and is partly yet retained) was Roman and is the same with Aemillinus, mentioned in Denbighshire, which the Inscription calls Almilini." This inscription, "Almilini Tovisaci," on a sepulchral stone, has much discussed, and one of the most eminent Welsh scholars and archeologists "considered this stone to be the memorial of a Welsh prince or Leader Emlyn"; moreover, that it dates from the fifth or sixth century: "Tovisaci" meaning "leader" or "general." In certain Welsh manuscripts appear "Dafydd Emlyn," "Siams Emlyn," etc., 1635. The name also appears in different parts of England in the same century. He was born in a Town called Shepton Mallet in Summersetshire [Somerset], was apprenticed a vintner in London, and his parents having died when he was young, he was put under the care and tuition of an Aunt, who was Presbyterian–he was one of that people till he arrived at mature age, when embracing the Principles of Truth, as we believe, or turning a Friend, he was deprived of his Aunt's favor, or any expectations from her, who was a Person of considerable substance in the World, when meeting her displeasure, he was necessitated to provide for himself. The account written by the sons then sets forth that "he came over sea with William Penn"; which expression is a general one, and does not signify that he accompanied Penn on the Welcome, but that he came over in Penn's time, and was among the early settlers in Philadelphia. The first positive record we have of him as a citizen of Philadelphia is upon the occasion of his first marriage, hereafter referred to, which took place November 12, 1685, which was about three years after Penn's first arrival in the province. We also find him in the first tax list for Philadelphia county, that for 1693, where he is indicated as assessed at the following amount: "150 pounds", which was above the average assessment of his contemporaries. As we have already seen, his business was that of a "vintner," "in which condition of Life," we are told by his sons, "he conducted with honour and good repute to the cause of Truth and to himself." Upon the occasion of his first marriage, in 1685, he was called "husbandman"–both terms signifying that he was engaged in agricultural pursuits, though the first-mentioned title, "vintner," indicated that he was more particularly engaged in the conduct of a vineyard, and the incidental manufacture of wine. George Emlen married, November 12, 1685, Eleanor Allen, daughter of Nathaniel Allen, a man of very considerable note, who was named by William Penn, September 30, 1681, as one of the three commissioners authorized to embark for Pennsylvania and lay out the city of Philadelphia. Three children were born to this first wife, all of whom died young; and the death of the mother occurred shortly after the birth of the third child. She was a dutiful child to her Parents & excellent wife to her husband, a loving mother to her children, an entire friend to the Poor & Distressed–undaunted in Danger–Religious and Ingenious–an easy mistress & good neighbor, neither lavish nor penurious–but an example of Industry as well to her own children as servants. Her precepts to virtue were pressing and earnest–her advice was to live in the fear of the Lord & to follow peace with all men, to keep to Truth and Plainness–to frequent religious meetings with great Industry–to act or do nothing but what became the followers of the meek & humble Jesus. She was well beloved by most that knew her & hath left a good name and dyed in Peace. .. .. .. She as a darling favorite of both her Parents, as well she might be. .. .. .. happy are the children who follow the advice and example of such a Parent. George and Hannah (nee Garrett) Emlen had eight children, as follows: George, Samuel, Caleb, Joshua, Hannah, Anne, Mary and Sarah. Of these, two died unmarried–Caleb, born June 9, 1699, and Hannah, born February 3, 1703-04. George Emlen, the eldest member of this family, was born May 7, 1695. In the family memorial already referred to, his brothers said of him that "he was a man of very good repute for sobriety, diligence, industry & care," and that, "being the oldest son, became as a tender Father to his Brothers & Sisters." He was engaged in business as a brewer, a vocation then followed only by the leading men of the province, and always, for many years, by those prominent in the counsels of the Society of Friends. He acquired considerable wealth, and lived in good style for that primitive era. That he was inclined toward some of the luxuries of life, in spite of his religious professions, is inferred from some items in the old ledger of a Philadelphia silversmith, engaged in business between 1733 and 1740, which show that George Emlen purchased the following: "1 Gold Girdle Buckel, and one Set of Gold Buttons, for his daughter, 1 silver waiter, 1 3 pt. Tankard, 12 table, 12 Custard and 2 Soup spoons," etc. He was elected, October 6, 1730, a member of the Common Council, then a position of much prominence, which was in effect a life office, under the charter of October 25, 1701. He was also one of the charter members of the Library Company of Philadelphia, denominated by Franklin the "mother of all the North American subscription libraries," which came into being under articles of association dated July 1, 1731. George Emlen was otherwise prominent in the happenings of his day, and a factor in the unfolding of the city's history. His residence was on the north side of Chestnut Street, above Fifth, opposite the State House, or Independence Hall. Around the corner, on Fifth street, between Chestnut, and Market, was situated his brewery. George Emlen married, April 24, 1717, Mary Heath, daughter of Robert and Susannah Heath, who had emigrated to Pennsylvania years before from Staffordshire, England. Of her, her brothers-in-law wrote that she was "many years a minister amongst Friends," and they referred to her experiences "when retired into the woods of this newly settled country, looking after her Father's sheep." Her death is said to have occurred June 2, 1777, though it is not certain that this date is correct. Her husband died in October, 1754. They were the parents of three children, namely, George, Hannah and Joseph, of whom the last named, born July 1, 1728, died young. The other two married and left issue, as will hereafter appear. Samuel Emlen, the second son of George and Hannah (nee Garrett) Emlen, was born April 15, 1697. He married December 2, 1731, Rachel Hudson, daughter of William Hudson, by his first wife, Mary Richardson. Her father, William Hudson, was named a member of Common Council in the charter of 1701, became an assemblyman in 1706, was advanced to the post of alderman, October 4, 1715, becoming at the same time an associate justice of the City Court, and filled the office of Mayor of Philadelphia in 1725-26. His wife, Mrs. Emlen's mother, Mary Richardson, was a daughter of Samuel Richardson, a noted character among the early colonists, a Provincial Councillor, etc. On the 12th Instant departed this life, RACHEL EMLEN (the wife of SAMUEL EMLEN) in the Sixty-fourth year of her age, after a lingering and tedious indisposition which she bore with such Constancy and Resignation, as rendered her the admiration of all whose Duty or Inclination led them to visit her. Un the course of her illness she had frequently to express her intire Satisfaction with the Will of her Maker, being abundantly convinced that a crown of Righteousness is laid up in store for those whose full Confidence is in the Lord. Thus, after a long and well spent Life, in which she honourably filled the Stations of an affectionate Wife, tender Parent, and charitable Citizen, she bid adieu to the fading Enjoyment of this World. Her Remains were interred on the 14th in Friends Burying Ground, attended by a respectable Number of Citizens. We have record of only two children born to Samuel and Rachel Emlen, namely Hudson and Sarah who will be referred to in due order. Joshua Emlen, the fourth child of George and Hannah (nee Garrett) Emlen, the third, Caleb, having died young, was born April 14, 1701. It was he, who, in conjunction with his brother, Samuel, prepared the memorial of his parents heretofore referred to. He attained prominence in commercial and civic affairs, having been elected, October 5, 1742, a member of the Common Council, of which body his eldest brother, George Emlen, had previously been chosen a member. W. D. and self took a walk this evening up Second street as far as Joshua Emlen's old house, which formerly was nearly out of town. There are eighteen or twenty new houses lately built between that and S. Noble's. Joshua Emlen was twice married, first, to Mary Hudson, nee Holton, widow of Samuel Hudson, eldest son of Mayor William Hudson, and eldest brother of Rachel Hudson, who became the wife of Samuel Emlen. His first wife having died, without surviving issue, Joshua Emlen married, secondly, November 29, 1728, Deborah Powell, daughter of Samuel and Abigail (nee Wilcox) Powell, and aunt of Samuel Powel–he spelled his name with one "l"–Mayor of Philadelphia 1775-76, and 1789-90. She was born October 24, 1706. By his second wife, nee Deborah Powell, Joshua Emlen had one son–there may have been other children, who died young–namely, Samuel Powell Emlen–subsequently known as Samuel Emlen only–probably the most noted member of the Emlen family of the eighteenth century. Of the four daughters of George Emlen, the emigrant ancestor, the eldest, who married, Ann Emlen, who was born May 19, 1705, became the wife June 15, 1732, of William Miller, from whom are descended, among others, members of the well-known Maryland family, the Ellicotts. Mrs. Miller's next younger sister, Mary Emlen, born January 1, 1707-08, married, in 1728, John Armitt, of a well-known colonial family, whose members were identified with the early history of Pennsylvania. There was no surviving issue by this marriage. The youngest of the Emlen sisters was Sarah Emlen, who was born March 19, 1709-10, and who, May 25, 1738, became the wife of James Cresson, son of Solomon and Anna (nee Watson) Cresson. She was the mother of four children, to wit: George, Caleb, Joshua and James. The Cressons, constituting one of the oldest and most reputable of the Quaker families of colonial times, many of whose representatives now reside in Philadelphia, will be presented hereafter in a separate sketch. Advancing to the next generation we have George Emlen, the elder of the two sons of George and Mary (nee Heath) Emlen, and the only one who married, who was born August 21, 1718. He succeeded his father in the brewing business, and followed him, also, in the occupancy of the elder Emlen's residence on Chestnut street. He also erected a country seat in the Whitemarsh valley, above Chestnut Hill, now known as the Emlen House, occupied at one time, in the fall of 1777, by General Washington. His position with relation to public affairs, in the momentous decade prior to the Revolution, is indicated by his signature, which we find attached to the Non-Importation Agreement of October 25, 1765. He married, December 25, 1740, Anne Reckless, daughter of Joseph and Margaret Reckless, of Chesterfield, N. J., and said to have been a great-granddaughter of John Reckless, sheriff of Nottinghamshire, mentioned in the journal of George Fox. It has been stated that, on the wedding day of George Emlen and Anne Reckless, the bridal party rode on white horses and the ladies wore white silk waists and red skirts. If this statement is correct it was certainly an innovation upon the usual decorous custom among the Quakers of that day, and must have created a sensation among the simple-minded Friends among their acquaintances. Of their posterity (several of whome have held conspicuous stations in civil & religious society & departed before her) 147 yet survived in the relations of children, grandchildren and great-grandchildren; herself long occupied the rank of an exemplary and charitable citizen, fulfilling with much propriety the duties of a parent, friend, neighbor and mistress. She retained her faculties to the last; and very shortly before her departure, sensible of its approach, warmly recommended to her numerous descendants to live in harmony and moderation. It has been stated that one of her daughters, and again one of her grandsons left this latter salutary advice in their respective wills, so that three successive generations have endeavored to impress it upon their offspring. George and Anne (nee Reckless) Emlen had issue, as follows: George, Caleb, Mary, Joseph, Margaret, Samuel, James and Anne, all of whom married except Joseph, born December 28, 1748, and Samuel, born August 25, 1757. Further reference will be made to the other six. Hannah Emlen, the only sister of George Emlen, who married Anne Reckless, was born June 1, 1722 and, March 24 1740, became the wife of William Logan, born July 14, 1718, and died October 28, 1776, the eldest of the sons–save one who died young–of James Logan, the distinguished statesman of colonial days, Mayor of Philadelphia, chief justice of the province, Governor, etc. Of the six children of William and Hannah (nee Emlen) Logan, the fifth, George Logan, was United States senator from Pennsylvania. The death of their mother, nee Hannah Emlen, occurred January 30, 1777. On the 26th Instant, about 9 o'Clock in the Morning, departed this Life, HUDSON EMLEN, of this City, Merchant, After a tedious and lingering Illness, which he bore with a Christian Fortitude, after expressing, in the Course of that fevere Conflict, and particularly towards his last Moments, a perfect Resignation to the Divine Will, and full Assurance that the Change would be his great Gain. Thus, at the most critical Period, evincing, that as his Life had been virtuously spent, he had an Earnest of that Peace, which is laid up in Store for the Righteous. Hudson Emlen's sister, Sarah Emlen, married, January 12, 1773, Thomas Moore, son of Richard and Margaret (nee Preston) Moore, grandson of Samuel Preston, Mayor of Philadelphia in 1711, and great-grandson of Thomas Lloyd, the famous President of the Provincial Council, and acting Governor, following William Penn's return to England, in 1684. To this generation, likewise, belongs Samuel Emlen, son of Joshua and Deborah (nee Powell) Emlen, the noted Quaker preacher or "Seer," as he was called, one of the most conspicuous and most influential among the leaders in the Society of Friends, during the last half of the eighteenth century. He seems to have had a natural bent for the ministry, to which work he began devoting his energies at an early age. When quite a young man, in 1753, he accompanied Michael Lightfoot, of Philadelphia, a noted Quaker preacher, in a religious tour of Virginia and North Carolina. Three years later, June 6, 1756, he sailed for Ireland, and, it is stated, it was "During this journey he first appeared in public, vocal ministry at Carlow, to the satisfaction of Friends." After a visit to England, upon a preaching tour, he returned to America in the following year, toward the close of 1757. He made numerous other visits to Great Britain during his life in a missionary capacity, notably in 1764, 1772, 1784 and 1792. In all he spent many years abroad in the work of the ministry. At 3 o'clock went to meeting again. Sammy Emlen came in and began in public testimony – that he had met some girls walking the streets and asked after their families and was told "they are pretty well, thank YOU." This introduced some close doctrine respecting not keeping to the plain language which, indeed, it seems as if the young folks have almost forgotten here. First day. Clear. M. S. J. D. and self went to morning meeting. A strange voice was heard to whom S. Emlen recommended silence and was obeyed. I know not who it was. During the Revolution Samuel Emlen took precisely the same position as did nearly all the leaders among the Quakers – that of antagonism to war upon religious grounds. And, like many others of that sect, was looked upon as a Tory, and compelled to bear his share of persecution at the hands of the more intolerant among the Whigs. According to Scharf and Westcott's History of Philadelphia, he was one of those whose arrest was deemed advisable by the Supreme Executive Council toward the close of the summer of 1777, as the British army threatened Philadelphia. If his arrest took place, he must have been liberated, as he did not accompany the Pembertons, the Fishers, Henry Drinker Sr., and others, who were sent into Virginia by the state and continental authorities. We lost great part of yesterday with a deputation of Quakers from their yearly meeting, Waln, Emlen, Joshua Morris, and two others declaring their own and the innocence of their Body, desiring prejudices against them might be removed as a Society, seeking in the world only peace, truth, and righteousness, with equal love to all men, etc. . . The General was for sending them to you and to Congress who had banished their friends. ... The General gave them their dinner, and ordered them only to do penance a few days at Pottsgrove until their beards are grown, for which they seemed very thankful. Our back parlor was filled this afternoon with company who came to ye Burial of our neighbor Carlisle; myself and four children went. Sister stayed at home; it was a remarkably large Funeral, and a solemn time; George Dilwyn and S. Emlen spoke at ye Grave. I went this morning to Sally Emlens who has been frightened by a mob that surrounded ye House at past one in ye morning, ye day before yesterday – after making a noise for sometime went away. Ye inspectors, I find, have been at most Houses today taking account of stores and provisions. Among those who are sometimes called the great men of this world, Samuel Emlen obtained access by the affability and courteousness of his manners, his general information and his unaffected engaging deportment. In religious meetings, his countenance and deportment were solid and instructive; in his public communications, his delivery was natural and unaffected; his views, clear and comprehensive; and a holy unction attended his gospel labors. In person he was small and slender; perhaps below common size. His constitution was said to be delicate and feeble from his youth; demanding great care and prudence, and the exercise of temperance and moderation. In the latter years of his life he was afflicted with a disease which at times occasioned much bodily pain. Stayed at home all day. Sammy Emlen called. I had a conference with him in the Blue parlor – touchant Baubette. Positively there was a lovers' quarrel, which the mutual friend was endeavoring to patch up. If so, she succeeded, as the marriage took place, as indicated, the following summer. My very dear friend, Betsy Emlen, departed this life, Jany ye – 1767, in Bristol, old England, leaving behind her 2 little sons. H. D. went out after breakfast, and when he returned informed us of the departure of Samuel Emlen, Senr. He died about 4 o'clock this morning, in the 70th year of his age; an old friend and acquaintance. He was husband to my beloved friend, E. Moode, between 5 and 6 years, and since to Sally Mott, for 26 years. I did not think the last time he was here, he was so near his end. tho' he was complaining. By his first wife, nee Elizabeth Moode, Samuel Emlen had two children, William, who died young, and Elizabeth, who married and had issue, as will presently be shown. A consideration of the next generation will be limited to the six married children of George and Anne (nee Reckless) Emlen, to two of those – a son and a daughter – of Samuel Emlen, the "Seer" just referred to; the Emlen name being alone handed down through these lines. George Emlen, the eldest of the children of George and Anne (nee Reckless) Emlen, was born April 25, 1741-2. He was a well known Philadelphia merchant, with a town residence and a country seat – that which had belonged to his father – in the Whitemarsh valley. I have just returned from a curious conversation with George Emlen about the works of Jacob Behmen which I looked into and which he pretends to understand, tho' he acknowledged some parts a little crabbed; particularly how to make our human nature to be compounded of Sulphur Mercury and Salt. I promised him Peter Millar the Dunkards Book of the God-femality in the stile of Behmen. Mr. Emlen is mentioned in Du Simitiere's famous list of eighty-four Philadelphians who, in 1772, were the owners of carriages of various sorts. He appears herein as the possessor of a "chariot," a class of vehicles also know, at that time, as a "Post-chaise." In the same list his father's cousin, Samuel Emlen, the Quaker preacher, is indicated as the owner of a "coach wagon." I think Sally Emlen is one of the most beautiful women I ever saw, agreeable, affable, sensible in the true sense of the words. Her conversation is so very lovely and diverting that were her personal attraction less than they are she could not fail of being belov'd. The death of George Emlen occurred November 23, 1812. His widow survived him eleven years, dying August 29, 1823. Their children were six in number, as follows: Anne, Elizabeth, George, William Fishbourne, Hannah and Mary, of whom five married and left issue; and from these respective marriages have come many Philadelphians of distinction, socially and otherwise. The eldest child, Anne Emlen, born July 6, 1777, and died February 4, 1851, married, August 29, 1801, Charles Willing Hare, of noted family. Among their descendants are not only the Hares, but also the Millers, whose sketches appear elsewhere in this series. The second daughter, Elizabeth Emlen, became the wife, October 13, 1808, of George Roberts, of the well-known Hugh Roberts family, concerning whom a special article will hereafter be written. Their only child, Sarah married Harry Ingersoll, whose family history is presented elsewhere in this series. The third child of George and Sarah (nee Fishbourne) Emlen, namely, George Emlen, born in 1784, died August 27, 1850. He was a lawyer, having been admitted to the Philadelphia bar, June 15, 1808. In 1818 he was elected a member of the Assembly. The next child, William Fishbourne Emlen, was distinguished in Quaker City commercial circles for many years, filling, at one time, the presidency of the Stock Exchange. He married, November 11, 1814, Mary Parker Norris, of the old colonial Isaac Norris stock. 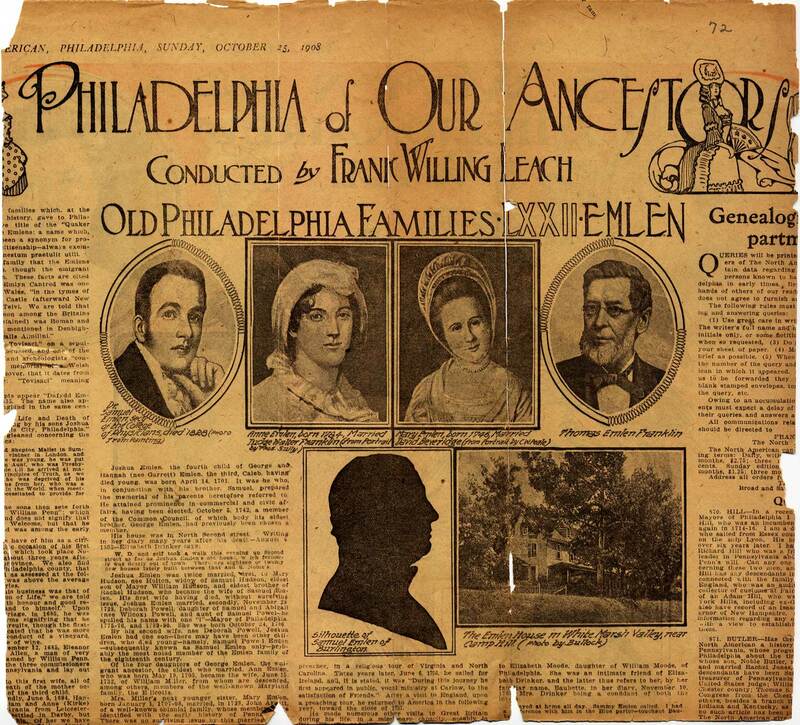 Of their four children one, George Emlen, who married Ellen Markoe, was a graduate of the University of Pennsylvania, a leading member of the Philadelphia bar, president of the Law Academy of Philadelphia, president of the Board of Controllers of the Public Schools, secretary of the Board of Trustees of the University of Pennsylvania, etc. His eldest son, George Emlen, born November 27, 1842, died November 25, 1907, also of the local bar, married Helen Rotch Wharton, born September 2, 1847, died July 7, 1900, daughter of Daniel Clark and Ann Waln (Morgan) Wharton. There were three children by this marriage: Anne Wharton Emlen, who died in infancy; Ellen Markoe Emlen, born January 21, 1877, died March 17, 1900; and Dorothea Emlen, born February 20, 1881, died March 24, 1932. Two sisters of George Emlen survived him, Mrs. James Starr (nee Mary Emlen) and Miss Ellen Emlen, both now deceased. Of the next generation the children of James and Mary Emlen Starr are James Starr of "Belfield", Germantown, who married Sarah Logan Wister and who has one child, Sarah Logan Starr; George Emlen Starr of Germantown who married, first, Caroline N. Newhall, now deceased, second, Emily Ayres whom he divorced and from which marriage there was one son, James Starr, 3rd, and third, Jeannette Rianhard Woodward; Mrs. Edward S. W. Farnum (nee Ellen Markoe Starr) of Chestnut Hill, who has three sons, Edward S. W., Jr. James and Ralph; Mrs. Oliver B. Judson, (nee Lydia Starr), Chestnut Hill, no children, and Theodore Ducoing Starr of Chestnut Hill who married Sarah Price Carmalt of Utica, and who have two children, Charlotte Churchill and Theodore Ducoing Starr, Jr.
Hannah Emlen, the fifth child of George and Sarah (nee Fishbourne) Emlen, married, April 6, 1820, Joseph Mickle Fox, of another old Quaker family of distinction. Mary Emlen, the sixth and youngest of the children of George and Sarah (nee Fishbourne) Emlen, became the wife, May 15, 1817, of John Morin Scott, Mayor of Philadelphia, 1841-43, concerning whose family, one of much distinction in America and Scotland, is given in this series. Returning to the generation represented by the George Emlen who married Sarah Fishbourne, we have his eldest brother, Caleb Emlen, born December 15, 1744. Like his father's cousin, Samuel Emlen, the "Seer," Caleb Emlen is mentioned, in Scharf and Westcott's History of Philadelphia, as one of the Quaker leaders whose arrest was contemplated by the Supreme Executive Council, just before the arrival of Howe's army in Philadelphia, because of his supposed Tory proclivities, based upon his opposition to armed resistance. Caleb Emlen married, February 25, 1773, Mary Warder, daughter of Jeremiah and Mary (nee Head) Warder, and had nine children, of whom one daughter, Mary Emlen, married Thomas Greaves; another, Anne Emlen, became the wife of Charles Pleasants, while a son, Caleb Emlen, married Maria Graeff. The latter had two daughters, Mary, who married Dr. Squire Littell, and Calebina, who became the wife of William Henry Newbold. This line is today represented by William Henry Newbold, Clement Buckley Newbold, Arthur Emlen Newbold, John Sargent Newbold, Trenchard Emlen Newbold, etc. The Newbolds will be treated of hereafter in a special article. Mary Emlen, the eldest sister of George and Caleb Emlen, born December 19, 1746, married David Beveridge, an Englishman, and died without issue, September 19, 1820. Her portrait was in the possession of Mrs. John S. Newbold. The next younger brother of George and Caleb Emlen, namely, Joseph Emlen, born December 28, 1748, died unmarried, as did, also, the next, Samuel Emlen, born August 25, 1757. The second sister, Margaret Emlen, born April 15, 1750, married, May 23, 1771, Samuel Howell, Jr., son of Samuel and Sarah (nee Stretch) Howell, who was born about 1748, and died October 31, 1802. He was one of the organizers, in 1774, of the Philadelphia Light Horse – the First Troop of the present day – and otherwise prominent in Quaker City affairs. A future article will be given devoted to the Howell family. Mrs. Howell, nee Margaret Emlen, died May 4, 1822. They had fifteen children, all of who married except two; one of them, Sarah Emlen Howell, became the wife of Water Franklin, attorney general of Pennsylvania. Nancy Emlen called but would not stop "till John arrived." She is a sweet innocent, but never I think beautiful, and her dress did not appear so singular then as I had had represented; candle light made some things which were brown appear white – her mind appears to be a perfect symmetry of heavenly love. Our family with the addition of my beloved friend Nancy Emlen supped together. She wore today a dark snuff colored Tabereen, but looked old and so awkward made that if her person was not so agreeable it would be disgusting – I mean the dress. She is not so handsome as Becky Gurney, but has all her sweetness of Countenance with a taller and more agreeable person. He took me one day to see his intended wife, Miss Ameland (Emlen) whom he was to marry in a few days. She is a worthy companion of this reputable Quaker. What mildness! What modesty! and at the same time what entertainment in her conversation! Miss Ameland once loved the World. She has renounced all these amusements, to embrace the life of an anchorite. In the midst of the world, she has persisted in her design, notwithstanding the pleasantries of her acquaintance. Mrs. Mifflin died March 21 or 22, 1815; her husband, October 16, 1798, he having been born 8 mo. 21, 1745. They had three children, Samuel Emlen, Lemuel and Mary Ann. 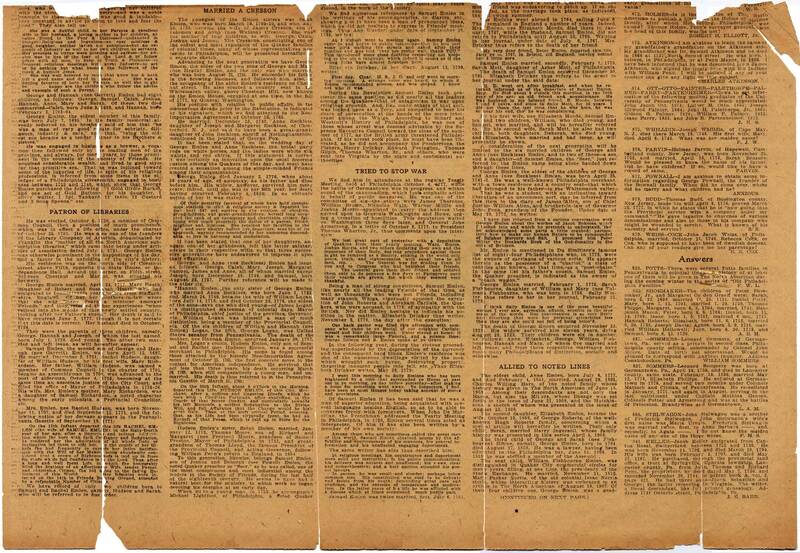 For further particulars the reader is referred to the Mifflin article, of which mention has already been made. James Emlen, another of these brothers and sisters, and the youngest son of George and Anne (nee Reckless) Emlen, was born June 26, 1760. He owned real estate in Philadelphia, but, preferring life in the country, he purchased property in Middletown, Delaware county, where he settled and thereafter resided. He was an elder in the Chester Meeting, having attained that dignity at an unusually early age, and was frequently delegated to attend the Yearly Meeting in Philadelphia. He was placed by that body on the first "Indian Committee" created by it – a standing committee which as ever since been in existence. A pestilential fever prevailing again in Philadelphia in the year 1798, he believed himself bound in duty to attend with his friends at the usual time and place for holding the Yearly Meeting, (which was the third time he attended under such circumstances). As many of his friends in that solemn season of great morality, partook of the common lot, in being suddenly removed from the field of probation, and considering himself as equally liable, he was engaged, before leaving his family, to make due provision for the careful guardianship of his six children, all in their early minority. Shortly after his return home from Philadelphia he was smitten with the dread disease, and died October 3, 1798, after an illness of about eight days. James Emlen married, April 23, 1783, Phebe Peirce, daughter of Caleb and Anne (nee Mendenhall) Peirce, and by her had issue, as follows: Anne, who, July 13, 1802, became the second wife of Judge Walter Franklin, attorney general of Pennsylvania, concerning whom further details will be given hereafter in an article on the Franklins; Joshua, who married Abigail Howell, nee Smith, widow of his kinsman, William Emlen Howell; Mary, who, October 1, 1807, became the wife of George Newbold of New York, of the Old New Jersey family of Newbolds, to which, also the Philadelphia Newbolds belong; Samuel, who married, November 4, 1819, Beulah S. Valentine; Phebe, who died single and James, who, January 11, 1816, married Sarah Farquhar, nee Foulke. The fourth of these children, Samuel Emlen, M.D., born March 6, 1789, graduated from the medial department of the University of Pennsylvania in 1812; spent two years abroad, in the prosecution of his medical studies, and researches, was secretary of the Philadelphia Board of Health in 1819, physician to the Friends' Asylum for the Insane, fellow of the College of Physicians, a member of the medical staff of the Pennsylvania Hospital from 1823, until his death, which occurred April 17, 1828. Dr. Samuel Emlen married, Beulah Sansom Valentine, as mentioned above. Elizabeth Ann Emlen, born October 4, 1822, and died January 16, 1907, married, October 17, 1850, Dr. William Rockhill Bullock, of Wilmington, Del., who was born October 4, 1824, and died November 18, 1914. Their son is John Griscom Bullock, born September 27, 1854, who married, June 6, 1888, Rebecca Malin Downing, and has four children: Margorie, who married Benjamin Le Boutillier and has three children; John Emlen, who married Dorothy M. Kinley; Francke Rumsey, who married Francess D. Klause and has two children; Richard Hunt Downing who is unmarried. Caleb Emlen, the second child to marry, was born August 20, 1824, and died March 20, 1895. He married, first, Hannah E. Dever, and, secondly, Mary L. Reese. By the first marriage he had six children, of whom only two survive [actually all but one survived to adulthood -dte], John Emlen, born February 24, 1850, and Marion L. Emlen, born June 15, 1862, who married George Worthington Scott, of Maryland. They have one child, Caleb Emlen [Scott], born 1894, married, 1917, Grace L. Comings of California, and they have five children, Dorothy L., George, Warrington C., Robert I., and Marion E. By the second marriage, Caleb Emlen had two children, Clement H. Emlen, born April 17, 1877, and Anna W. Emlen, born February 15, 1881, who married Warren F. Hubley, of South Orange, N.J., and has two children, Barbara Emlen, born February 9, 1912, and Richard Wright, born February 18, 1919. [Here's some more info, since this is my branch of the family -dte: The six children of Caleb and Hannah (nee Dever) Emlen were Samuel, born October 3, 1849 in Darlington, Maryland and died January 7, 1883 in Chester, Pennsylvania (Samuel was listed as an attorney at law in the 1880 census; he did not marry); Mary Dever, born August 19. 1852 in Darlington, Maryland and died April 12, 1923 in Philadelphia (she did not marry); Charles, born September 17, 1854 in Triadelphia(? ), Maryland and died October 24, 1901, married Ellen Goddard Ewing November 2, 1882; John Dever (mentioned in the above paragraph), born February 24, 1859 in Maryland and died April 18, 1943 in Alameda County, California (he did not marry); James W. (twin of John Dever), born February 24, 1859 in Darlington, Maryland and died November 19, 1874 (at 15 years old); and Marion Lloyd (mentioned above), who married George Worthington Scott on March 3, 1893 and died April 6, 1935 in Oakland, California. Mary Cresson Emlen, the third child to marry, was born October 16, 1827, and died May 2, 1923. She married, April 12, 1849, Clement H. Smith. No issue. George Williams Emlen, the eldest child, born May 4, 1853, married October 4, 1877, Eleanor Cope – died January 5, 1920 – and had five children: Mary Cope Emlen, born July 3, 1878, married, April 27, 1904, Alfred Garrett Scattegood, and has six children, Elizabeth Cope, Eleanor, Henry, Caroline, Roger, and Arnold. The eldest child, Elizabeth Cope Scattegood, married April 18, 1930, Andrew Burns Chalmers, D. D. Samuel Emlen, Jr., born March 27, 1880, married, June 7, 1906, Marion Hartshorne Haines, and has six children: Samuel 3d, Catharine Haines, Elizabeth Hartshorne, Frances Seth, Marion and Julia Hartshorne. Arthur Cope Emlen, born April 9, 1882, married, April 14, 1920, Marie Albertson, and has four children, Sarah, Eleanor Cope, Marie and Arthur, Jr. George Williams Emlen, born May 7, 1887, married, June 12, 1912, Eleanor Clark, and has six children: Elizabeth Clark, Robert Lukens, George Williams, 3d, Alan Lukens, James and Benjamin. Esther Margaret Emlen, born April 27, 1890, died February 6, 1927, married, September 21, 1913, Shippen Lewis, and has three children: Dora, Mary Emlen, and Louise. James Emlen, the second child of Samuel and Sarah (Williams) Emlen, born November 12, 1854, died July 4, 1922, married, December 13, 1877, Susan Trotter Thompson. Their son, John Thompson Emlen, born December 28, 1878, married March 6, 1906, Mary Carpenter Jones, and has four children; Susan Thompson, John Thompson, Mary Carpenter and Woodruff Jones. Sarah Emlen, the fifth child of Samuel and Sarah (Williams) Emlen, born April 15, 1861, married, May 14, 1896, Walter Thomas Moore. Mary Emlen, sister of Sarah Emlen, born June 25, 1863, married June 19, 1890, Dr. Joseph Stokes. They have three children: Eleanor Stokes, who married Robert Chapman Smith, and has three children: Mary Emlen, Robert Lawrence, and Nancy Stokes; Samuel Emlen Stokes, who Married Lydia Pratt Babbott, and has four children; Samuel Emlen, Lydia, Sallie B., and Ann Richardson; and Dr. Joseph Stokes, who married Frances Elkinton, and has three children: Jean Frances, Joseph and Donald Elkinton. Anne Emlen, the eighth and the youngest child of Samuel and Sarah (Williams) Emlen, born November 24, 1865, married, October 17, 1889, Walter Penn Shipley. They have three children: Thomas Emlen Shipley, born December 25, 1890, who married Mary Parker Wroth, June 11, 1918, and they have two children: Anne Emlen Shipley, born December 24, 1921, and Thomas Emlen Shipley, Jr., born January 22, 1925; James Emlen Shipley, born April 4, 1894, who married, March 20, 1920, Ruth Ewart, and has two children: James Emlen Shipley, Jr., born July 1, 1921, and Sarah Elizabeth Shipley, born June 30, 1922; and Walter Penn Shipley, born November 2, 1897, who married May 14, 1927, Mary Dawson Strawbridge, and has two children: Paul Emlen, born December 18, 1929, and Marianne Dawson, [living -dte]. Returning to the generation represented by the children of George and Anne (nee Reckless) Emlen, we have the two children of Samuel Emlen, the "Seer." His only adult child by his first wife, Elizabeth Moode, was Samuel Emlen (1766 - 1837), whose home was in Burlington, N. J., and who founded the "Emlen Institute" for negroes and Indians, afterwards merged into the Colored Normal School, at Cheney, Chester County, Pa. He married, April 16, 1795, Susannah Dillwyn, daughter of William and Sarah Logan (nee Smith) Dillwyn, who was born March 31, 1769, and died without issue, November 24, 1819. Elizabeth Emlen, half-sister of the last-mentioned Samuel Emlen, and the only married child of Samuel Emlen, the "Seer" by his second wife, Sarah Mott, became the wife, September 18, 1800, of the celebrated surgeon, Philip Syng Physick, a number of whose descendants reside in Philadelphia.